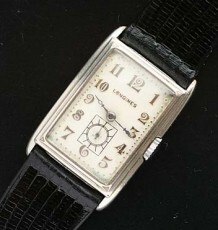 Classic vintage Longines watch, with solid 14 karat gold case. 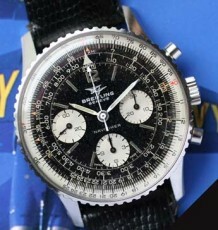 This vintage watch pretty much covers all the key points that make vintage watch collecting so appealing. The watch features a solid 14 karat yellow gold round case with slightly elongated lugs at either end. The case is quite heavy compared to a steel model due to the greater density of gold over steel. The all original dial has the most unusual linen pattern with incredible gold coloured Arabic numerals as the hour markers. 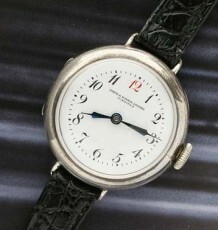 The original period correct dauphine hands are still fitted to the watch. 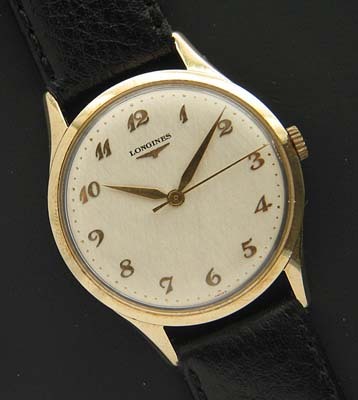 The watch dates to 1959 based on the serial number of the manual wind Longines 17 jewel calibre 23ZS movement, which was just serviced by my watchmaker and keeps excellent time. 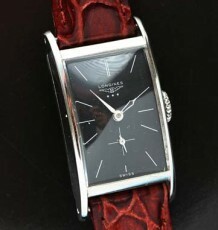 The case which is fully signed Longines and hallmarked 14K gold, measures 35 mm wide by 43 mm long including the lugs.